Regular exercise benefits us immensely. Having regular physical activity boost immune function, improves circulation, prevents chronic illnesses, improves mood, and minimizes our risk for injury. But is it safe for the elderly to have a fitness regimen? The answer is a resounding yes. They should have moderate physical activity to remain healthy and reduce health risks. Even those who are suffering from chronic illnesses can engage in moderate and safe physical activity to slow further deterioration. In fact, studies have consistently shown that since exercise boosts the immune system, it can improve the health condition of seniors who have chronic illnesses such as diabetes, heart disease, hypertension, and osteoarthritis, to name a few. For the elderly, doctors recommend 30 minutes of exercises that improve respiration, circulation, and endurance. The goal here is to increase the elderly’s heart rate and respiratory rate. For seniors with debilitating conditions and who cannot tolerate continuous physical activity, it perfectly okay to break up the routine into shorter, more frequent sessions spread throughout the day. Developing an exercise plan for the elderly Assisted living facilities develop exercise plans appropriate for seniors. Usually, fitness activities are done in a class setting, under the supervision of a certified professional, to encourage participation among the residents. Custom exercise plans are also devised for seniors with special needs. For the elderly who are able to engage in moderate physical activity, a combination of exercises that aim to improve endurance, strength, balance, and flexibility are recommended. Generally, exercise plans for seniors provide for 150 minutes of fitness activity each week, which is broken down into several 10- or 15-minute sessions several times each day. Below are low to moderate intensity activities appropriate for seniors aged 65 and older you’d find in most exercise plans for seniors. Wall push ups. Wall push-ups are a great way to improve the strength of the chest and shoulder muscles among the elderly. Stand 3 feet away from a wall, feet firmly planted on floor. Spread feet so that they are shoulder-width apart. Bend the elbows and slowly lower the body. Slowly push back to original position. Abdominal contractions help increase core strength. Take a deep breath and feel your abdomen expand. Exhale and tighten your abdominal muscles. Maintain the contraction for 3 breaths. Heel raises are a great way to strengthen your calf muscles, especially your upper calves. Sit on a comfortable bench or chair. Keep both feet flat on the floor, a few inches apart. With your back straight, slowly lift your heels. Weight-shifting. Shifting weight is an effective way to improve balance and prevent falls and injuries. Stand straight in front of a chair, with both feet hip-width apart. See to it that your weight is evenly distributed on your feet. Shift your weight to your right foot and then slowly lift your left leg about 3 inches off the floor. Do 3 repetitions per leg. This exercise will increase stability. Stand straight in front of a chair with your feet firmly planted on floor, hip-width apart. Bend your knee and raise your left foot, extending your leg until it is halfway between the floor and your buttocks. Hold position for 15 seconds. Slowly lower your left leg to the floor. This simple exercise helps improve stability and mobility. In a standing position, place your right heel in front of your left toe. Then put your left heel immediately in front of your right toe. Repeat until you complete 5 steps. Neck stretches are great for relieving tension in the neck and upper back areas. In a standing position, keep your feet flat on the floor, shoulder-width apart. Place your hands at your sides. Slowly turn your head sideways to the right and continue until you feel a light stretch. Maintain the position for 15 seconds. Do the same exercise in the opposite direction. Do 3 repetitions per side. Ankle stretches promote range of motion in the ankles and improve flexibility in the muscles in the area. Sit near the edge of a chair. With heels placed on the floor, bend both ankles so toes point toward you. Move your ankles so that your toes are pointed away from you. Seniors can greatly benefit from endurance exercises. Low to moderate impact endurance exercises such as walking, bicycling, swimming, dancing, stationary bike riding, and water aerobics, especially when done twice a week, increase the heart rate and respiratory rate and in effect, improves circulation and respiration. For optimum results and if the weather permits, it is recommended that endurance exercises be performed outdoors to promote overall well-being. Plus, seniors will get to breathe fresh air and get their dose of sunlight. 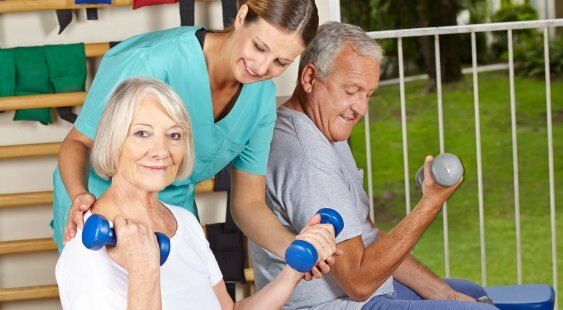 Are you looking for an assisted living facility that offers a great exercise program for its residents? Start your search with us. Our company, SSMAPS, maintains a well-curated database of senior care providers in the United States. Using our website’s easy-to-use search feature, you can search for ALFs and other elderly care providers in your area.